Jonathan Rea on the Kawasaki ZX-10RR during practice at Lausitzring in Germany on Friday. Jonathan Rea emphasised the importance of last month’s summer test at the Lausitzring in Germany after finishing second fastest following free practice on Friday. The World Superbike champion was 0.332s behind his Kawasaki team-mate Tom Sykes, who set a new lap record of 1m 37.172s on the ZX-10RR in FP2. Rea, who leads the standings by 59 points from Sykes with five rounds remaining, is aiming to close the deficit in final practice and Superpole qualifying on Saturday ahead of race one (12:00 BST). “We are so lucky to have been able to come here two weeks ago and have a test and take away a few gremlins I had had about the track previously,” he said. “I was starting to feel really good about the track but today we missed something to really allow me to push to the maximum but we are not so far. “Today I never put anything together to make me feel really comfortable. We will study the data tonight and understand the areas we can improve to come back stronger tomorrow. Toome’s Eugene Laverty was sixth fastest overall on the Milwaukee Aprilia, seven tenths back on Sykes. 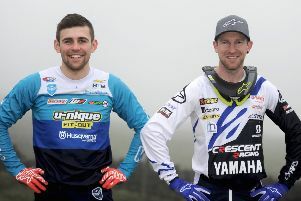 The German round heralds the return of the championship after a five-weekend break. Meanwhile, Michael Laverty (McAMS Yamaha) was eighth fastest during free practice for this weekend’s MCE British Superbike meeting at Cadwell Park. Glenn Irwin, still not fully recovered from injuries he sustained in a crash at Knockhill, was 14th on the PBM Ducati, with Andy Reid in 17th on the Tyco BMW. In the Supersport class, Keith Farmer was quickest in the dry FP1 session from Jack Kennedy and Andrew Irwin. The Sprint race takes place on Saturday afternoon at 5:15pm. Alastair Seeley misses the event on the Spirit Moto2 machine but will be in action on Sunday at Bishopscourt in Co Down, where he makes his return to the Masters Superbike series for the first time since 2009. Racing is scheduled to commence around 12noon.